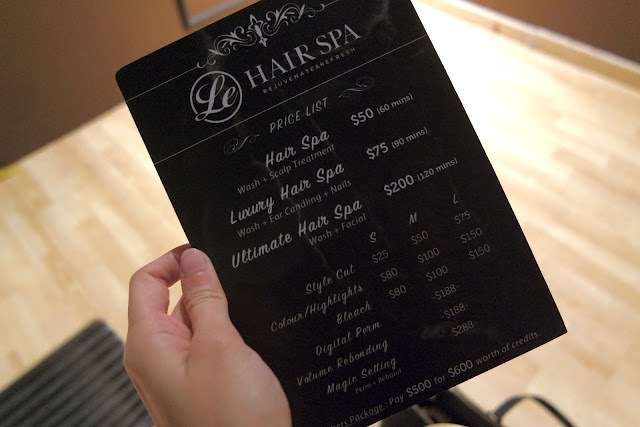 A couple of weeks ago, Shane and I were treated to a couple's hair and face spa at Le Hair Spa! On the outside, Le Hair Spa really didn't look like much but as we were led through what looked like any other ordinary hair salon..
& through this leather-padded walkway, I instinctively gasped in awe! Lo and behold, we were greeted with an unexpected sight of luxury! 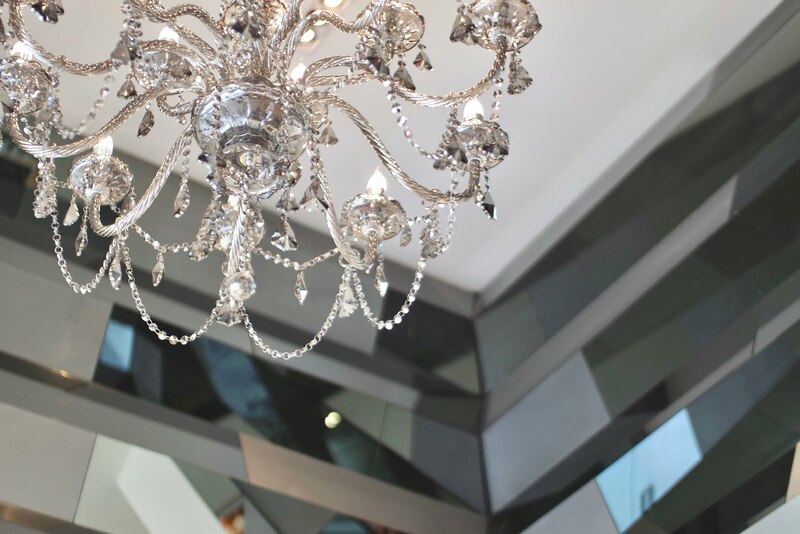 A guest area adorned with a huge chandelier, high ceiling and a grand marble staircase! We were then led up the stairs and through the corridor to a private couple's room where our much-needed rejuvenation session awaited us! I really loved the privacy of the room, it made us feel like real VIPs but on top of that, it gave us that assurance to relax without fear of any other prying eyes - cause you know, sometimes it can get quite awkward with people around. With this being my first ever hair spa, I was quite curious as to what the pampering session consists of. Prior to our visit, I was told that the session would take about 2 hours and I really didn't see how anyone could wash hair for 2 hours?! So I was really excited to see what was in for us! We started out with a really relaxing neck and shoulder massage - Shane and I go for massages pretty often and we're used to the kind where the masseuse uses a lot of strength to "loosen up your muscles and knots in your body" so we could tell that this massage was really just for relaxation purpose but it was enjoyable nonetheless! Shane actually fell asleep! 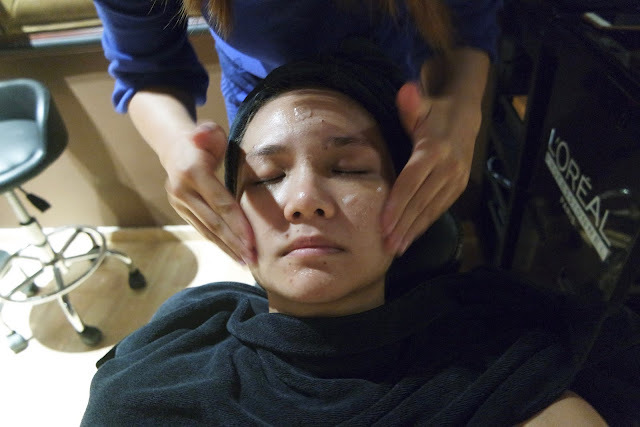 Next, we had a facial which involved cleansing, a gentle scrub, and this rich moisture mask that made my skin feel so rejuvenated even on the next day! It was SO relaxing, I was half wishing I didn't have to take photos for this review just so I can fall asleep and really enjoy getting treated like a queen! After the facial, we were pampered with a wonderful hair wash coupled with a scalp massage and all! I kind of wished we could have had our hair washed while we were lying down cause that would have really added to the shiok factor. They did lead us to a room to lie down and wash the foam off & to condition our hair though! The only thing I was quite disappointed about was that they didn't have any serum to put on my hair after drying it out. My hair's quite damaged from all that bleaching so a little hair serum would have been nice to have. They did however, add drops of hair tonic to my roots to aid in hair growth! But apart from that, I would definitely give this place another visit to pamper myself or treat a loved one on their special occasion! It's actually a pretty good place to bring your girlfriend/wife to and have her pampered and treated like a queen! If you're wondering how much it costs, we had the 2-hour Ultimate Hair Spa which costs $200 but they also have other treatments which you can try! 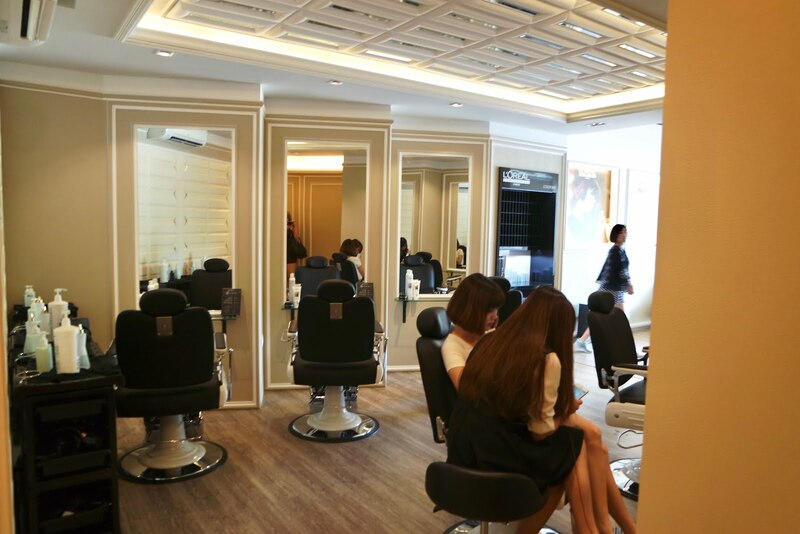 You can find our more about Le Hair Spa and their services in their website below!